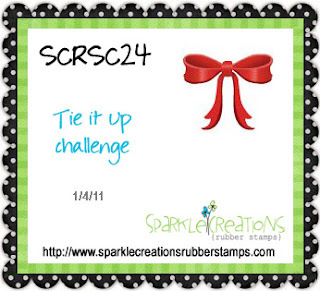 HandKrafted by Stephanie: SCRS Challenge #24 -- Tie it Up! SCRS Challenge #24 -- Tie it Up! Hello! 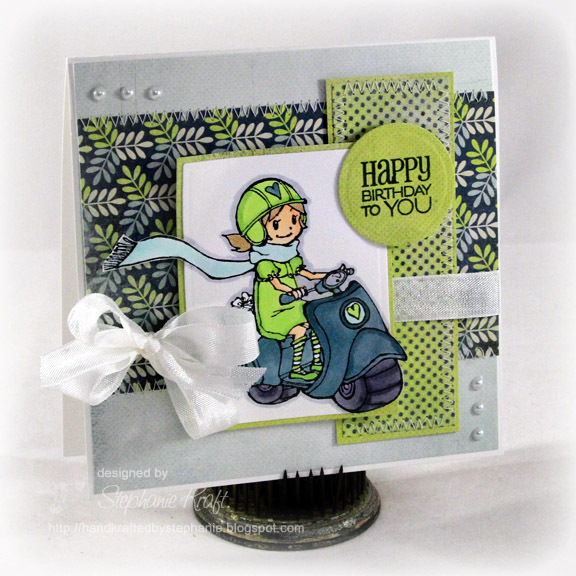 It's time for an all new Sparkle Creations Rubber Stamps Challenge! We hope you all enjoyed your holidays and are ready for some new challenges! Each week we will post an all new challenge at this time (9 PM PST on Mondays). For all the details, please visit the SCRS blog. This week, we welcome our fabulous January Guest Designer, Cindy Haffner! This week's challenge is to "Tie it Up" (use ribbon, string, twine, etc. on your project). I used Scooter Chloe this week. I paired her with some Basic Grey Marjolaine paper, seam binding ribbon and white flat back pearls from Pizzazz Aplenty. Sentiment is from Verve's Birthday Bash. 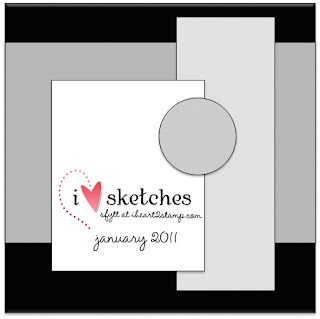 My layout is the January Sketch For You To Try. Accessories: Classic Rectangle and Circle Nestabilities (Spellbinders), Markers (Copic), Seam binding ribbon, White flat back pearls (Pizzazz Aplenty), Foam tape, Thread, Sewing machine. So cute! We both used the same sketch, hehehe! Ohhh I just LOVE him!! Simply sweet! Love her in green! Fab card, Stephanie! Super cute card Stephanie! Love the bright green outfit! Stephanie - fab card! I do love that colour scheme, such a sweet image too. I love the detail of the stitching, ribbon and pearls. Fab!! Great card - love the scooter girl. Thanks for your comment on my blog - much appreciated. Wonderful design! Love how you colored chloe and the papers are fab. So bright and fresh looking - cute image and fun details too. Love this, Stephanie! Great job with the SFYTT!